CHRISTAS TIME IN NYC. ACTUALLY IT WAS WNEW CHRISTMAS CONCERT THAT YEAR. ALSO YOKO ONO CAME OUT TO ASJK FOR CHARITY.PEOPLE SHOULD HAVE GAVE PEACE A CHANCE.THE WIFE OF THE LATE GREAT JOHN LENNON GOT BOOED OF THE STAGE.HE MUST HAVE GOTTON ILL OUT IN THE BLUE FIELDS. GREAT SONG SHOOT HIGH AIM LOW. ALSO AMAZING GRACE WAS FANTANTIC.BUT YES SEEMS TO BE ALMOST METALLIC INSTEAD OF MELODIC THESE DAYS. A COOL SHOW BUT NOTHING COMPARED TO THE GOING FOR THE ONE TOUR OR TORMATO. Yoko did indeed get booed , although they did collect a lot of money . She got booed for being Yoko , not the cause. 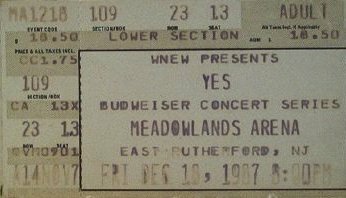 I saw them on the Big Generator tour at the Meadowlands in NJ. It was approaching Christmas time. There is a charity for cancer research called (sp?) the T.J. Martell Fund, and before the concert, Yoko Ono came on stage to ask the crowd to leave contributions on the way out. The second she came out, she got booed, and it got louder and louder until she left the stage. Not before or since have I seen someone get booed for promoting a cancer charity.